Despite the current popularity of Kindles and other e-readers, there is still nothing quite like the solid feel of a good book in your hands, whether it's your companion in a hammock on a lazy summer afternoon or an antique volume that you've purchased for its investment value. Proper storage of your collection of hardbounds and paperbacks will not only make your favorite novels and works of reference easy to find and use whenever you want, but also keep them in top shape for years to come. 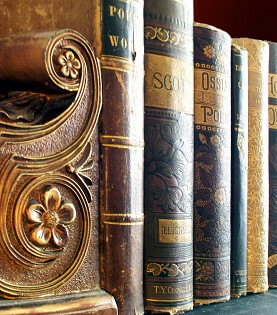 Books are made up of paper and bindings that tend to be sensitive to atmospheric conditions. Damp is especially problematic, since it both warps pages and encourages mold growth and insect infestation. For either daily use or long-term storage, do not keep books in an environment that is moist or prone to flooding. Excessive dryness is equally dangerous, as are strong sunlight, poor air circulation, and direct sources of heat. Ideally, books should be kept at 60-65 degrees Fahrenheit, with a relative humidity of 45-60 percent. This means that you should not house your collection of books in the basement, on a screened porch, in your garage, or close to the floor, if at all possible. Instead, show off your library in the living room, dining room, or (should you be lucky enough to have one) an actual home library. Use a dehumidifier for dampness control if necessary. A special note regarding heirloom cookbooks: Your kitchen's fluctuating levels of heat and moisture can wreak havoc on beloved cookbooks and Great Grandma's handwritten "receipts." Carefully scan or photocopy favorite recipes and then store the originals in a safer place. When you order new bookshelves, metal is an excellent choice because it will not damage your valuable books. In the Pacific Northwest, where much of the wood used in American furniture making is sourced, Portland carpenters advise that bookcases made of Oregon oak and other popular woods are attractive but may give off lignin and acid. These vapors are harmful to books and other paper items. If you already own wood bookshelves, make sure that they are adequately sealed. As an alternative, you might want to line the shelves with sheets of inert materials. Glass, acrylic, or stable plastics are recommended. Do not pack your books tightly together on the shelves to avoid damage and make sure that air can circulate freely around them. Regular dusting with a chemical-free cloth or soft brush (work from the spine outwards) will help preserve the pages in good shape. And yes, Mom was right when she told you always to wash your hands before touching precious books. Even if your skin looks clean, it still contains oils that are destructive to paper. Inexpensive and readily available, cardboard boxes are frequently used for long-term storage of book collections. However, besides being vulnerable to mice, fire, or wear and tear, cardboard (just like unsealed wood) can off-gas acids which are hazardous to your home library. Plastic is preferable for containers as long as they are not placed in extremely humid areas, where they will promote mold. Do not use PVC or plastics of unknown source, but only polyethylene, polypropylene, or polyester (polyethylene terephthalate or PET). Dedicated archival quality boxes are the best choice. Pack books horizontally or vertically, with the heaviest on the bottom. Check each volume to make sure it is dry, as well as free of dust, food particles, and high acidity items like bookmarks or pressed flowers. Valuable hardbacks should be covered with film jackets made from stable, inert polyester for extra protection. If your boxes are going into self-storage, make sure that your unit is climate-controlled. Use pallets or other supports to guard against moisture absorption from the unit's concrete floors. How Much for Custom Built-In Bookshelves?